Hello and welcome to Morpurgo Class! 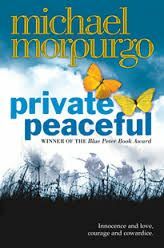 I'm sure the name Morpurgo sounds familiar to you all, as in recent years, the author, Michael Morpurgo has been on our televisions and in our theatres and cinemas. With his children's novel, War Horse, he has become a household name, as it has been made into an award winning, West End theatre production and in 2011, a blockbuster movie. Morpurgo, a former primary school teacher, was the third Children's Laureate from 2003-2005, inspiring many children to read and to write. Some of his most famous books include, Kensuke's Kingdom, Private Peaceful and Toro! Toro! Come and have a look in our classroom to see our very large paintings of his book covers. For more information about Michael Morpurgo have a look at his website here.